The ensemble of Minnesota Opera’s world premiere production of The Fix, which opened Saturday at the Ordway Center for the Performing Arts in St. Paul, Minnesota. Photo by Cory Weaver. It’s rather poetic that Minnesota Opera’s The Fix premiered just days after breaking news of a major college admissions fraud and bribery scandal. As with “Shoeless” Joe Jackson and the rest of the players at the heart of the infamously rigged 1919 World Series, celebrity idols have been toppled and the crowd is restless and clamoring for blood. The story of the 1919 World Series – the so-called “Black Sox Scandal” – is at the heart of The Fix, written by Eric Simonson and Joel Puckett for MN Opera’s New Works Initiative. It has mob connections, crass bribery, peer pressure, and old-fashioned greed cut into a backdrop of looming Prohibition, post-war economic unrest, and old fashioned bread-and-circuses. Joshua Dennis (center) as “Shoeless” Joe Jackson, with the Chicago White Sox players and baseball reporters. 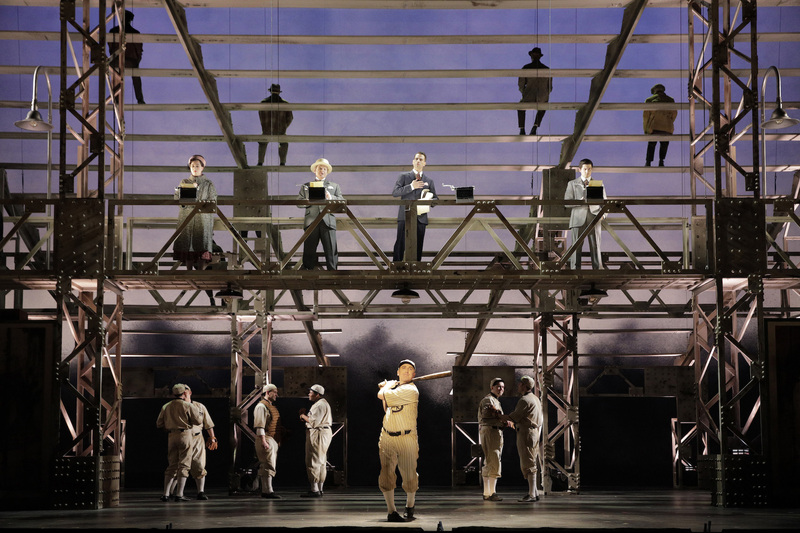 The scenic design by Walt Spangler features a dramatic backdrop of stadium bleacher seating, seen from below. Photo by Cory Weaver. As told through Simonson’s libretto, The Fix fixates on “Shoeless” Joe Jackson (Joshua Dennis), a star hitter whose batting average remains one of the highest in the history of Major League Baseball. Dennis plays Jackson with an amiable charisma; he delivers several quite lovely arioso passages, especially when singing about or with Jackson’s wife Katie, played by Jasmine Habersham. Habersham’s brief but memorable appearances are an integral part of this male-centric story and grounding our understanding of (and sympathies) for “Shoeless” Joe. Much of the opera’s most beautiful music was written by Puckett for the pair to sing. Since this is an opera about baseball, there’s naturally a large ensemble that plays an important role. Choreographer Heidi Spesard-Noble and stage director Eric Simonson use this ensemble very effectively at bringing the baseball scenes to life, whether showing the practice pen or aspects of a game. A dugout fight scene (Tom Ringberg is the fight choreographer) is especially well-done and engaging in music and action. Less effective are the several scenes with background dancers moving to a silent soundtrack; these elements are more distracting than additive, and highlight how the orchestral score often opposes, rather than supports, the sung-through dialogue. 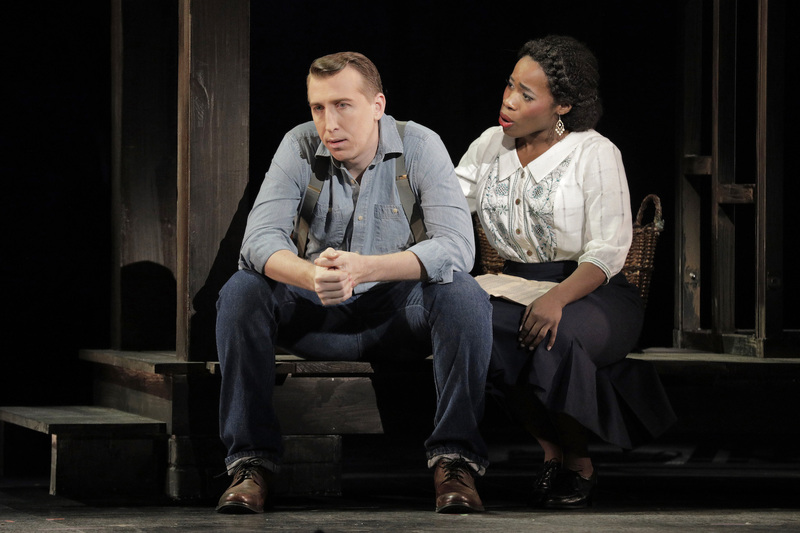 A guilt-stricken “Shoeless” Joe Jackson (Joshua Dennis) and his wife Katie Jackson (Jasmine Habersham) discuss courses of action. Photo by Cory Weaver. The musical idiom used by Puckett is not anchored in common practice tonality, but not altogether far from it, either. Major seconds figure prominently in the score, and there’s a distinct Love motif associated with “Shoeless Joe” and Katie Jackson; that same motif is also used by other characters singing about their passion for baseball. (Listen for vibraphone, harp, and bowed strings – and, for bonus points, take note on which instruments follow with different characters and scenes.) Most dialogue is delivered in a form of accompanied recitative, with characters breaking into short arioso passages and occasional full arias, duets, and ensemble scenes. This recitative is one of the weaker aspects of the text setting. as rendered in the performance, Puckett’s score broadly ignores the natural accents and varying durations of syllables in recitative. In more than one scene, this makes it hard to pin down the characters’ inflections of potentially innocuous or ominous phrases. A notable exception is the powerful locker room scene, commandingly overseen by Wei Wu as Arnold “Chick” Gandil. 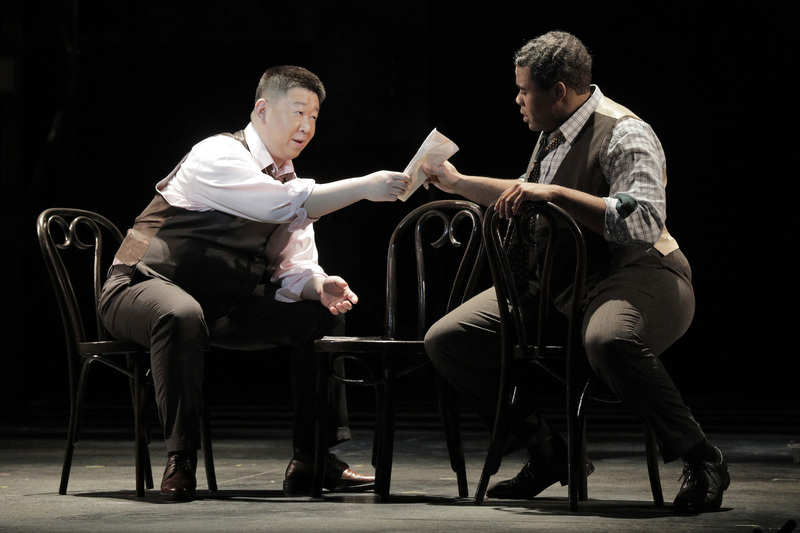 Even seated, Wei Wu dominates the locker room with his powerful bass voice and an intimidating presence, adding important layers not found in the notes of the vocal line or orchestra score. Other notable performances include Kelly Markgraf as Ring Lardner and Dennis Petersen as Hugh Fullerton, two reporters whose commentary provides an important narrative glue and whose jabbing adds key moments of levity. There are some passages in Simonson’s libretto that seem to take on a special ring in these present times, talk of systems being rigged against the players and ironic remarks like “the field is level”. A hundred years after the Black Sox Scandal, some things never change in how they ring. The odd anachronistic malarkey aside, the libretto feels a product of the period, a vibe reinforced by select moments in Puckett’s score that evoke the Jazz Age. A deal is struck, and sealed with cash. Wei Wu as Arnold “Chick” Gandil and Nicholas Davis as Fred McMullin in The Fix. Photo by Cory Weaver. The Fix is not a bad opera, but it’s not an extraordinary one in its current form. Several scenes are dramatically unnecessary and could easily be shortened or cut to improve the pacing and flow. The dramatic impact of the Black Sox suspension, for example, is undermined by a spoiler announcement delivered out of time – something apparently intended to cloak a victory song in a shroud of tragedy, but which ends up pulling what would otherwise have been the narrative’s surprise suckerpunch. The audience’s limited view of the players’ reaction is unsatisfyingly brief, an odd-man-out moment in a show that otherwise does so well at using the ensemble to convey excitement, tension, and energy. The final barn and store scene is also unnecessary – the kind of “tie it with a bow” detail best confined to a program note or lecture remark, rather than cluttering up the close. Ring’s final aria is a fitting sendoff by itself, powerfully written and grippingly delivered by Kelly Markgraf, and needs none of the above to close things with a real bang. The Fix plays through March 24 at the Ordway Center for the Performing Arts in Saint Paul, MN.